Kind time of the day, dear artists! In today’s drawing lesson we’ll show you how to draw a BMW i8 – a hybrid car from the company BMW. Now there are many cars that try to move away from gasoline, but still, their appearance doesn’t change radically. 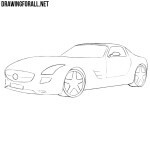 So we will draw the BMW i8 in the same way as we drew a Mercedes S class or all other cars on our site. 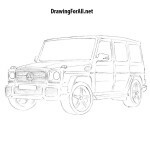 So we take pencils and with the help of very light lines sketch out the basic outlines of the car. In the second step we usually add the most basic parts of the car that are on the body, and this lesson will not be an exception. With the help of very light lines we sketch out the arrangement of the radiator grille, bumper and headlights in the front part. Further sketch out the wheels, mirrors and details on a lateral part. Starting with this step we will use dark and clear lines. And as always we start from the front of the car. Using straight lines draw the angular lines of the headlights of our BMW i8. 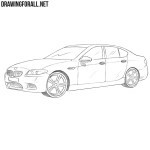 Next, draw the characteristic lines of the radiator grille of BMW (similar to the grille of BMW 7 and any other BMWs). Now draw out the line of the hood on which the air intake is located. Now let’s get a little lower and using curved lines draw the bumper of our BMW i8. Do not forget to erase all unnecessary lines from the front of the car. The front of the car is ready and we move to the top. Continuing the hood line we draw a slightly curved line of the roof. Next, draw the lines of the windows as shown in our example. 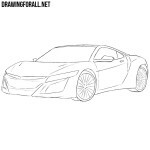 Continue the drawing tutorial about how to draw a BMW i8. Using curved lines draw the rear-view mirrors that look like leaves of trees. Next, draw the line of the door and the details on the side of the car. 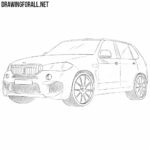 Perhaps the most difficult step in the drawing lesson about how to draw a BMW i8 step by step – here we will draw the wheels. 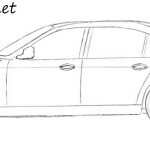 It is difficult because the wheels should be perfectly rounded. The wheels are ready and we start drawing the rims. Note that we have drawn standard BMW i8 rims, but you can choose some other kind of rims. Also you can add some shadows as in tutorial about how to draw a Chevrolet Camaro. By the way, this is the first hybrid car on our site. We already have a lot of gasoline cars, such as Ferrari and even electric car Tesla.